History Repeats? Activist Tom Hayden on Police Brutality Protests from the 1960s to Baltimore | Democracy Now! JUAN GONZÁLEZ: As protests continue in Baltimore and around the country over the death of Freddie Gray in police custody, we’re joined today by one of the leading longtime activists in the country, Tom Hayden, who’s no stranger to police and protest. In 1968, Hayden was a major organizer of protests against the Vietnam War during the Democratic National Convention in Chicago. AMY GOODMAN: He became one of the Chicago 8, was convicted of crossing state lines to start a riot. The judge ordered one of his fellow defendants, Bobby Seale, the only African American, to be bound and gagged and chained to his chair. Later, Tom Hayden would organize in Newark. Among his books, Rebellion in Newark: Official Violence and Ghetto Response. Well, Tom Hayden joins us for the hour today in our New York studio. We’ll talk about protest movements and their effect. We’ll also talk about Cuba. Today also is the 40th anniversary of the fall of Saigon, and more. But first to these protests, protests around the country around the death of Freddie Gray. And, Juan, you were in Baltimore at a labor conference, but it certainly passed through the halls of your assembly. JUAN GONZÁLEZ: Yeah, and it was a big topic of discussion among labor leaders who had come from around the country, and especially from Baltimore itself. Everyone was talking about the curfew and the police presence, and, of course, critical of the mayor of Baltimore for some of her remarks calling some of the protesters “thugs.” And it showed a class division that exists in Baltimore between the elite leadership there, even African-American leaders, and the masses of people who are sick and tired of the divide and the—not only economic divide in Baltimore, but also of the continued police repression of the black community. AMY GOODMAN: And as the officials advise people to wait, to remain calm, they’re saying tomorrow—interestingly, May Day—that information will be coming out, reports will be coming out. A report was, quote, “leaked” to The Washington Post of the prisoner who was picked up in the police van about five minutes at the end of Freddie Gray’s journey in that van, after he was arrested. And according to this leaked report, the prisoner said that Freddie Gray was thrashing about, maybe trying to injure himself. Now, again, he couldn’t see him. There was a partition in the van. And the family and the lawyer saying, “Are they saying that Freddie Gray actually fractured his own spine?” And how would that explain also his crushed voice box, his crushed larynx? AMY GOODMAN: They’ve also pointed out he wasn’t seat-belted in the van. AMY GOODMAN: So he was just—yes, definitely, his body was probably moving about. JUAN GONZÁLEZ: But also, those of us who are familiar with police reports know that when you’re having a police investigator supposedly transcribing the testimony of someone else, there’s all kinds of room for manipulation of what’s actually been said. And it is amazing that so much time has passed, and we still don’t know—really have any official report on what happened to Freddie Gray and why he was injured, to begin with. So, I think the length of time it’s taken to have any kind of official report has also added to the frustrations in the community. AMY GOODMAN: Although the number of investigations—you’ve got the police investigation. You’ve got the Department of Justice investigating. And it also just leads to the whole issue of when there is an incident with police where someone is injured, why doesn’t it immediately go to an outside body, an outside investigator, to look at what’s going on inside? Right now we’re waiting for the police report on themselves. JUAN GONZÁLEZ: Right. And, of course, those reports are filled out immediately, so that there are reports, it’s just that they’re not being released to the public. And certainly, when the public has such intense interest, it behooves the authorities to get that information out as quickly as possible. AMY GOODMAN: Well, we’re joined right now by Tom Hayden, one of leading activists in this country for decades, also happens to be a former California state senator. He was one of the founders of Students for a Democratic Society. Tom, as you look at what’s happening in Baltimore—and, you know, I just flew in from The Hague last night as protesters are marching down 7th Avenue. More than a hundred of them have been arrested just here in New York. You and Juan were in a conversation about your book at Barnes & Noble in Union Square, and there were hundreds of people outside protesting the death of Freddie Gray, but overall police action. You know police action. Go back to Chicago. AMY GOODMAN: And certainly, the protests have been multiracial all over the country, including Baltimore. TOM HAYDEN: Sure, sure. I was going to say, the thing that stands out here, my reaction that stands out, is there’s a subtext. Nobody will say “lynching.” But when you have a black man whose neck has been broken, they speak of the larynx or the upper neck, but he had his neck broken. And it’s so outrageous and disturbing that people don’t understand that that’s what they’re talking about, when a police spokesman asserts on national television that Freddie Gray choked himself to death, lynched himself, did it to himself, according to somebody who didn’t see it in the next cell over in this wagon. AMY GOODMAN: Or refer to the protesters as a lynch mob. AMY GOODMAN: The attorney for the Fraternal Order of Police. TOM HAYDEN: —overt rhetoric. And I was in Newark as a community organizer in 1967. And this can go back to the '40s or the ’20s, but in 1967 it was alleged that there was a sniper. They never found the sniper. Twenty-six people died—two were white, a firefighter—I think, due to ricochet and friendly fire, but it was alleged—Time magazine ran huge photos of black hands on a gun. But no gun was found. No sniper was found. And I had the task of interviewing people who were the victims' families and reconstructing what happened for The New York Review of Books and Random House. And it was this guy was shot in the back while running from police, this one was shot while drinking a beer on his porch, this woman happened to be shot in a window, and on and on and on. And what happened is, the grand jury was convened to bring me in to tell them who really was to blame. They were blaming the eyewitnesses and not the police. No good will come of this, because we’ve seen this is the missing gap—this is the gap in the '60s: many social achievements, cultural achievements, environmental achievements, but no change in inner-city poverty levels, little change, if any, in policing. This whole neoliberal policy, which is what they call it abroad, of divesting from the inner city to reinvest in Mexico or Central America and replace the jobs in the inner city, that used to be working-class industrial jobs, with service jobs or no jobs at all, and then mass incarceration—doesn't that explain the remaining battle ahead? And we need all hands on deck to confront this issue, because I’m not sure the political will is there. JUAN GONZÁLEZ: Tom, I wanted to ask you—this issue of the rioting that occurs in the aftermath of a police confrontation, this is almost endemic in American history. You go back—you were mentioning Newark in 1967. Chicago in 1919—the major race riot in Chicago that occurred in 1919 was touched off when a young black youth was swimming in an all-black section along Lake Michigan, and he happened to move over into the white section. He was attacked and drowned. The police come, and instead of arresting his killers, they end up arresting some of the African Americans who were demanding that the white killers be arrested. That touches off a riot. Dozens of people were killed. Time and again throughout American history, generation after generation, it’s a police confrontation in the African-American and Latino community that touches off widespread violence. And yet we don’t seem to learn from it or reform it, or every generation seems doomed to repeat the same—the same problem. TOM HAYDEN: It makes you worry if you’re in the business of trying to evaluate the facts of the matter, because people don’t see it factually. Some white people see it as a necessary way to subdue and control the savage impulses of the inner city. People on the receiving end see it as harassment, plain and simple. Newark started because a cabdriver was pulled over by police. He got into an argument with them. They beat him up. Five days later, the city had been completely devastated. So, you’re right: It’s a pattern. 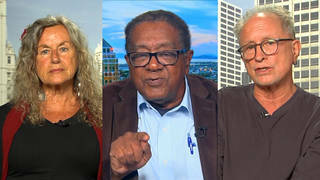 AMY GOODMAN: And speaking of subduing, if you can briefly, before we go on to our next segment and talk about your latest book on Cuba, talk about being one of the Chicago 8 and what happened to Bobby Seale? Explain, especially to young people who weren’t even born then, why you were charged and convicted of conspiracy to riot. JUAN GONZÁLEZ: Although it was eventually overturned, right? TOM HAYDEN: He was the chairman—I was going to—he was the chairman of the Black Panther Party at the time. And he was already in jail for conspiracy to murder. Those charges were also dropped. But in the Chicago case, he asserted a right to defend himself, which is a right that black people got after the Civil War. And so, when his name was mentioned, he would stand and say, “I wish to call a witness.” And the judge thought his standing was not only an insult to order, but a threat to order. When he would talk from a yellow pad, that was a threat. So the judge just one fine day said, “Deal with that man.” And they took him out, and the next minute he’s back in, chained and gagged to a chair. And when I’ve said this to young people and they’ve seen it in movies, they always say afterwards, “Well, that was creative license, wasn’t it? That didn’t really—you’re exaggerating. It’s dramatic fiction.” I said, “No, no, this actually happened not once, but day after day, until it was finally brought to an end.” That happened in our lifetime. JUAN GONZÁLEZ: And the judge eventually severed him from the case and sentenced him to four years for contempt of court? TOM HAYDEN: Yes, and none of that happened, either. None of the charges held. He never came back to trial. But it inflamed and polarized opinion, one side thinking it reminded them of slavery—clank, clank, clank—when the chains going, and the other side thinking, “Well, he deserved it. I mean, he’s a completely uncontrollable black man. Of course the police must have seen a threat, and they should have tied him up.” It’s amazing how people see things in utterly different, polarizing ways. Amazing. AMY GOODMAN: We’re talking with Tom Hayden, longtime activist and former California state senator, one of the founders of Students for a Democratic Society. One last question before we go to break, around this 50th anniversary of the first anti-Vietnam War teach-in at your alma mater, University of Michigan—you were there in Ann Arbor—and today, the 40th anniversary of the fall of Saigon. TOM HAYDEN: And the 50th anniversary of the first march against the war. So we’re having a gathering in Washington—and we appreciate your participating—for the first time the old antiwar movement reuniting in one place. And it couldn’t be a more appropriate time to learn the lessons, because you will remember, the last time tanks were in the streets, really, was during the Vietnam War, when the effort to end poverty and create jobs—the slogan “jobs and justice,” 1963 march—was forgotten by the escalation of the war in Vietnam. And what followed were probably 700 incidents. We were tongue-tied whether to call these riots, rebellions, insurrections, thuggery. It all depends on perspective. But the country came to near collapse. Baltimore today was everywhere in 1967, 1968. So we have to remember that these issues of going abroad to fight enemies leaves our internal problems festering, and they can blow at any time. So, history repeats, I’m sorry to say. AMY GOODMAN: And some people are calling “thugs” the new N-word. We are talking with Tom Hayden, one of the founders of Students for a Democratic Society. Yes, 40 years ago, the fall of Saigon; 50 years ago, the first anti-Vietnam War march; 50 years ago, the first anti-Vietnam War teach-in; and also, it’s been a half a century of an embargo and sanctions against Cuba. We’re going to talk about that, as well. Stay with us.